Special teams ruled the Ricoh Coliseum Saturday afternoon as both the Utica Comets and Toronto Marlies recorded multiple power-play goals in the Marlies 4-2 win. The Comets snapped an 0-for-10 skid on the power play and converted on their last two power plays of the evening. Hunter Shinkaruk (1-0-1), and Jordan Subban (1-0-1) handled the scoring for the Comets, while Joe Cannata recorded the loss. Chris Higgins, in his first game as a Comet, recorded an assist on Subban’s third period goal. In just his second game as a member of the Marlies, Rylan Schwartz jammed home a rebound from a Viktor Loov slapshot from the point to open the game’s scoring just 2:38 into the game. Just a minute into the second period Mark Arcobello skated along the goal line and slipped a shot over the short-side shoulder of Joe Cannata to extend the Marlies lead to 2-0. The Comets cut the lead to one when Hunter Shinkaruk buried his team-leading 16th goal of the season. From the point, Alex Friesen drove a slap shot on net that Garret Sparks was there for. The rebound kicked right back out to the slot to a waiting Brendan Gaunce who quickly one-touched a pass over to Shinkaruk who immediately, and easily buried the puck into the yawning cage. The power-play goal was Shinkaruk’s ninth power-play goal, which leads the team. The Marlies regained their two-goal lead when Kasperi Kapanen forced a rebound past Cannata as he scrambled in the crease. Late in the third period the Comets clawed back to within one when Jordan Subban walked into the high slot and ripped a wrist shot past the glove of Sparks. Chris Higgins recorded the secondary assist on the play, his first point as a member of the Comets. With the loss the Comets record drops to 18-16-3-3. The Comets finish the weekend with another 3 p.m. afternoon game against the Toronto Marlies tomorrow at the Ricoh Coliseum. 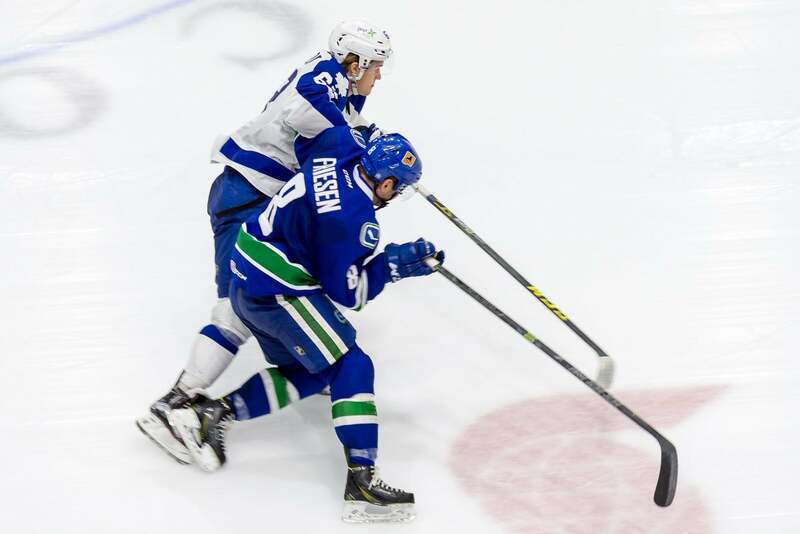 Tonight’s Game: The Utica Comets take on the American Hockey League’s best, and highest scoring, team this afternoon at the Ricoh Coliseum in downtown Toronto. The Comets, currently in fourth place in the North Division, have played the Marlies to a 1-1-0-2 record this season. Last Game: The Comets and Travis Green made history with each notching their 100th regular season win with a 1-0 overtime thriller over the Albany Devils a week ago at the Utica Memorial Auditorium. The 100th win came in the franchise’s 191st game, and increases the team’s all-time record to 100-67-15-9. The Comets finally solved the riddle that was the Albany Devils thanks in part to heavily outshooting them 44-14, including a 17-1 advantage in the first period. Carter Bancks (1-0-1) provided the lone goal for the Comets 3:05 into overtime, while Richard Bachman earned his first shutout as a Comet with 14 saves. Scouting the Marlies: The Comets face a huge test this weekend with two games North of the Border. The Marlies lead the league in wins (32), points (66), and goals for (163). Oh, and they have three of the league’s top scorers this season in T.J. Brennan (15-24-39), William Nylander (14-20-34), and Mark Arcobello (14-19-33). In net the Marlies have had six different men play between the pipes with Antoine Bibeau seeing the most action with 19 games under his belt. The goaltender owns a 14-4-0-0 record, a 3.08 goals against average, and a .896 save percentage. Lucky Number 3: The Comets 100th win was one of a kind so far this season. It was the first time the team has won a game when they have scored less than three goals this season. When the Comets fail to reach the three-goal mark in a game, the team is 1-12-3-2 this season. When they successfully strike three times, the team is 17-3-0-1. Hey Now, You’re an All-Star: The American Hockey League announced last Thursday that Hunter Shinkaruk has been named to the Eastern Conference All-Star Classic Roster. Shinkaruk, 21, in just his second season as a professional, leads the Utica Comets in goals (15), assists (15), power-play goals (8), and points (30) in 33 games played. The 24th overall pick in the 2013 NHL Entry Level Draft made his National Hockey League debut for the Canucks against the Montreal Canadiens on Nov. 16. In 2014-15, his first professional season, Shinkaruk recorded 31 points (16-15-31) and 28 penalty minutes over 74 games played. The Calgary, Alberta native also scored six points (4-2-6) in 23 postseason games with Utica through the 2015 Calder Cup Finals. The 2016 Toyota AHL All-Star Classic, will take place January 31 and February 1 in Syracuse, N.Y.
Next Game: The Comets finish off the weekend with another 3 pm start tomorrow afternoon in Toronto.